Fantasy Football Players Declining in U.S. The chart above shows the combined MAU for the top 5 season-long fantasy football apps in the month of September. Keep in mind you can play fantasy football without a mobile app but most people find the apps convenient and user friendly, and therefore do use them. When I say “season-long” I mean that these apps are not used to play daily fantasy sports (DFS). 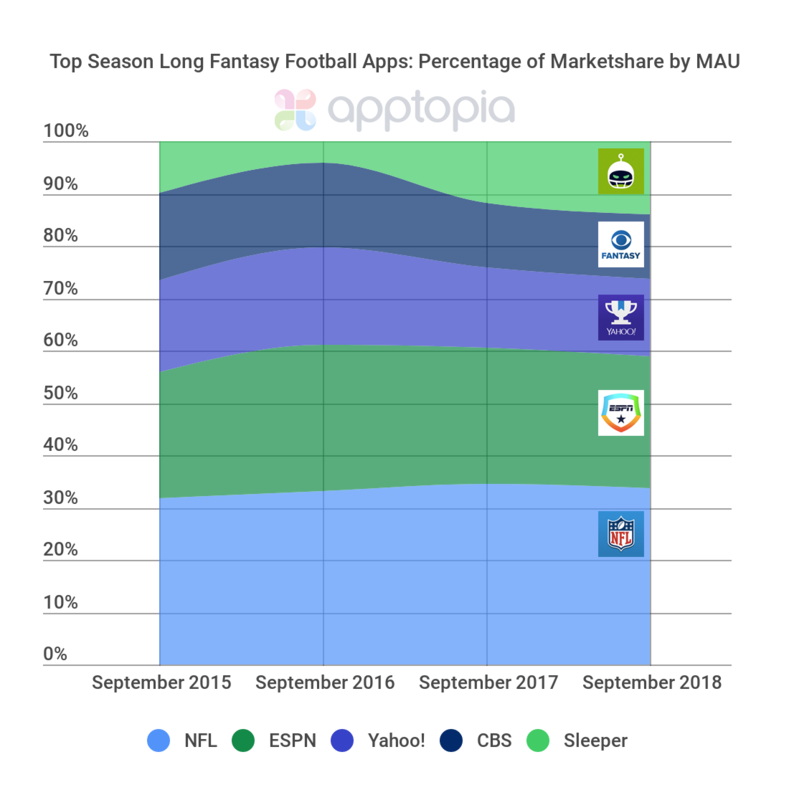 There one exception is the Yahoo app, but I would wager this makes up a small percentage of its users, and chances are high the DFS users are playing season-long as well. Now, why did we choose September for our measurement? September is when the NFL season starts and there are the highest levels of engagement for season-long fantasy football. Everyone is super excited and still in the running for the championship. There is typically a drop off in engagement after September/October. Market share remains largely stale in terms of movement. 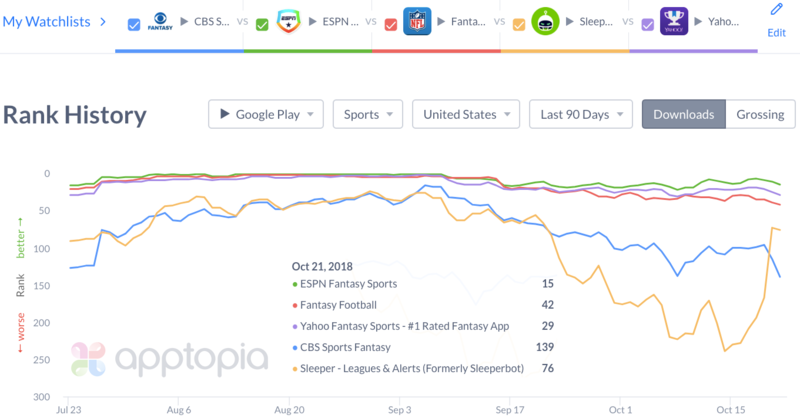 Sleeper is the only app who has had movement; gaining market share at the expense of the CBS fantasy football app. Sleeper has started to become more well known for its flexibility and ease of use for specialized leagues and/or longer term leagues. The NFL and ESPN apps (more so the NFL one) are the clear leaders in the space. This is not unexpected as their websites and other digital properties are top sources for people seeking out professional football news and information. It provides a nice, qualified top of the funnel for their fantasy football communities. 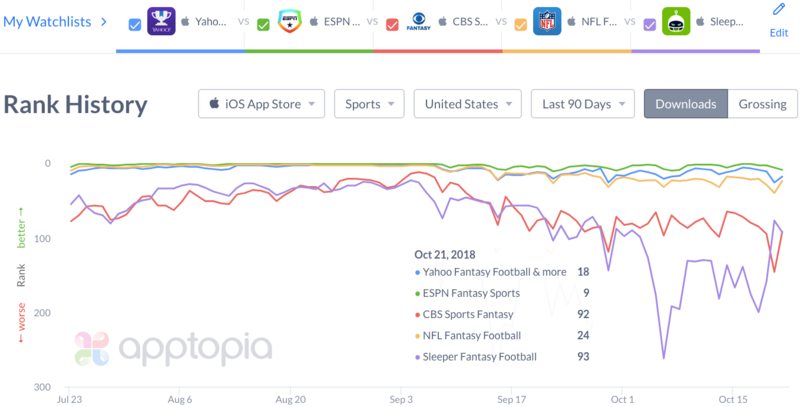 The NFL app had the smallest percentage decline at -23% while CBS Fantasy had the largest decline at -46%. As you can see in the current app store rank charts below, ESPN is leading the pack in both stores with Sleeper diving much deeper into the ranks than the competition. For those of you who follow professional football, you will have noticed the NFL making a big push for an international audience, especially in London. 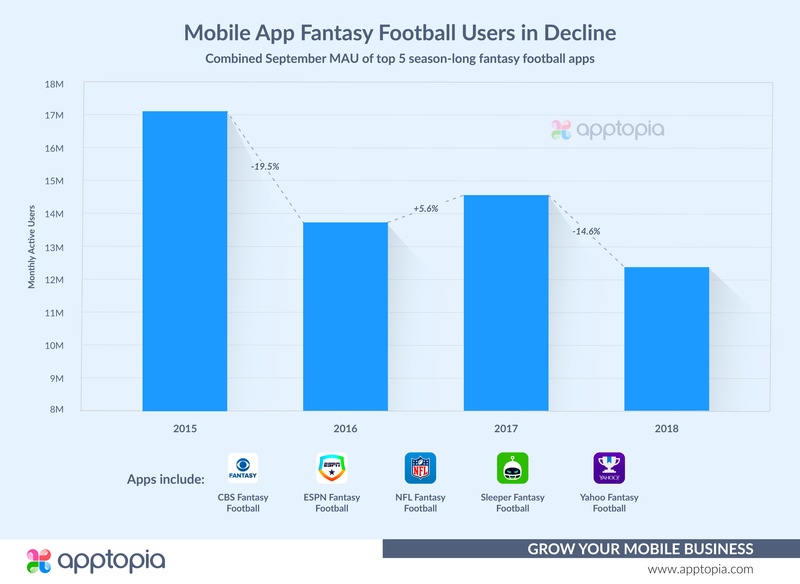 Looking at Apptopia data in the UK, the ESPN and NFL fantasy football apps combined have grown September MAU more than 30% since 2015.